It seems incredulous the church could have evil people in its midst. The Biblical view of the Lord’s body should not be skewed by the mistaken idea that everyone is looking out for the spiritual interest of the kingdom of God. They are not. Reading about the early days of the church shows the struggles faced by the first Christians as ungodly men filled the hearts of God’s people with immorality, false doctrine and lies. Jude’s little epistle of six hundred words is filled to the brim with warnings against those who would try and destroy the work of God. Not everyone who is a Christian is seeking the will of God. Often they are pressing their own agenda corrupting the minds of innocent brethren. Contending for the faith is an active rebuke of false teachers who deny the faith of God. 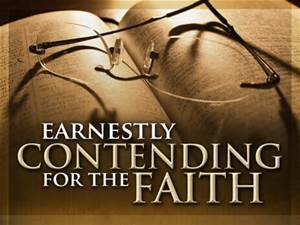 As a verb, ‘contending’ suggests action. The sacredness of the word of God cannot abide those who would wrestle the truth to their own gain. Christians need to be vigilant in keeping false doctrine from entering the church and the lives of God’s people. Apostasy has destroyed the eternal souls of millions of those who blindly follow men proclaiming a message foreign to scripture. Why are there so many churches and why are believers in Christ not united? Too few souls are honestly contending for the faith. Historically the path of apostasy can be traced to certain men and while blame can be placed upon their teachings, there is a responsibility that brethren should face in failing to earnestly contend for the truth of God. Jude was writing to the “beloved”, those “who are called, sanctified by God.” Everyone has a responsibility to examine the words of men with the truth of God. The common salvation should be a daily part of the life of every Christian. False doctrine tickles the ears of those who have no knowledge of the truth. The ignorance of scripture has done more to destroy the work of God when brethren fail to stand against teachings not found in scripture. It is difficult to contend for something without knowing what to contend about. A few snowflakes have little impact but combine a lot of snowflakes and you have an avalanche. The point is that if more people would become students of the Book, contending for the truth would be more active in keeping the tentacles of false doctrine out of the church. Why are brethren beginning to embrace musical instruments in the body of Christ? Less contending. What is the cause for worldliness to be so common among the people of God? Little resistance. Worship has become a time of casual playtime where people come to be entertained because no one contends for the truth. It happened in the New Testament church and it is happening in the church today. Some people in the church have evil motives. Jude describes men who creep in unnoticed. Their purpose is to extol their virtues of ungodliness on the simple hearts of those who do not know the truth. The grace of God becomes an open door allowing anything and everyone to live as they choose without any boundaries – and all in the name of Jesus Christ. Churches fill with families living the American dream of materialism, hedonism, immorality and covetous hearts. Sin is no longer recognized. The lack of contending for the faith opens the door to the wiles of the devil. Every generation faces the challenges of keeping the church pure from such defilements. These are dire warnings. Written two thousand years ago does not diminish the impact on the church today. Satan is still fighting to destroy every congregation of God’s people he can successfully fill with dead hearts. Contending earnestly is a clarion call for God’s people to embrace the common salvation delivered to men in the purest form of truth. Saints must build themselves up in the faith of God by spending time with the word of God and in prayer. There is a war going on and while victory has been assured, there will be many victims who fall prey to the seduction of ungodly men. Sin must be shown for what it is. The mercy of God is given to all men to find salvation and all men must stand upon the conviction of truth and truth alone.